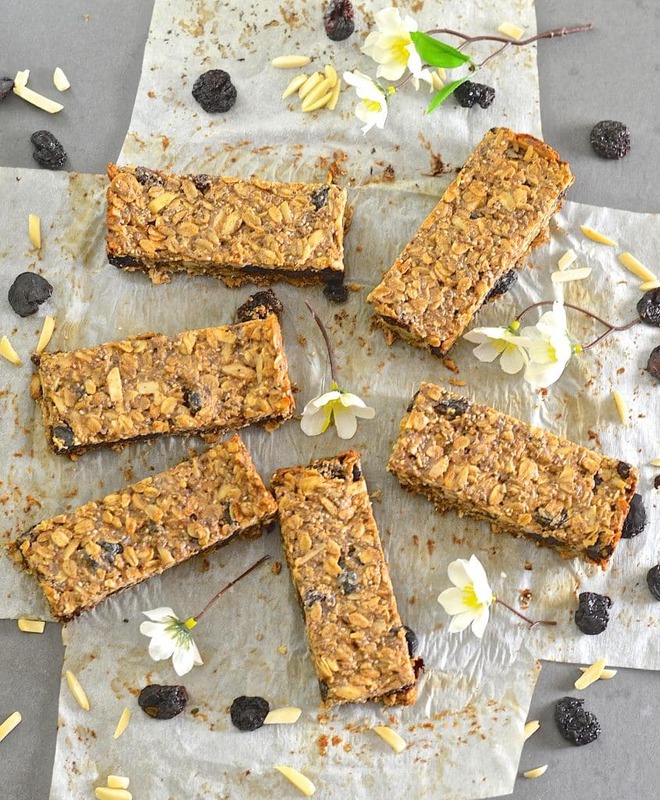 Plump, chewy dried cherries, crunchy almonds & wholesome oats & seeds make these Cherry Almond Granola Bars the perfect healthy snack or on the go breakfast. They are completely oil free, very lightly sweetened & come with bake or no bake options! The beautiful cherry blossoms might be coming to an end but that means the fruit is on it’s way which can only be a good thing. Not much can beat sweet, juicy, fresh cherries but when shopping recently I happened to spot the biggest, juiciest looking dried cherries I have ever seen in the bulk bins. I couldn’t resist and came home with a great big bag of them. I had never cooked with dried cherries before. I have no idea why as they are a wonderful ingredient and they pair just perfectly with the almonds and oats in these Cherry Almond Granola Bars. 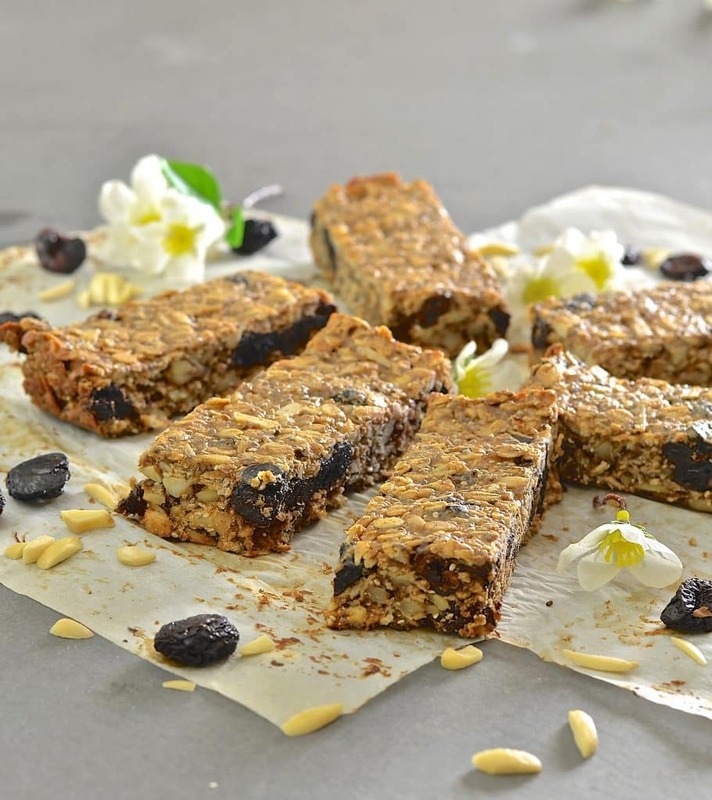 These Granola Bars are extremely easy to make and once mixed up, can be set up in the fridge then eaten raw, or baked in the oven. The choice is yours. They are good both ways. 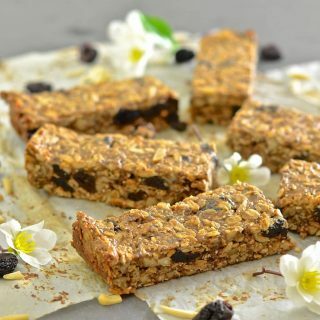 I prefer them baked as they get a nuttier, toasty flavour and delicious crispy, chewy bits but if you are following a raw food diet, or prefer a softer granola bar then the unbaked version will be great for you. The finished Cherry Almond Granola Bars are perfect for lunch boxes, snacks and on the go breakfasts. They are full of healthy ingredients and are only very lightly sweetened with a tiny bit of maple syrup. They also contain no refined sugars and are gluten free, dairy free and oil free. I really wanted to drizzle these bars with melted chocolate. They would be so wonderful. But, after a run of pretty indulgent cooking and recipe testing and because I have a few chocolatey recipes coming up very soon, I decided to leave them as they are and be terribly good. Willpower isn’t something I usually have much of so I am pretty proud of myself for resisting. Please feel free to add some chocolate to yours if the urge hits though. Once the guilt of having eaten far too much Maple Walnut Cake passes, I might well join you! If you give this recipe a try don’t forget to let me know. Rate it by hitting the yellow stars, comment below, or tag me #avirtualvegan on Instagram. If you love granola bars then you might also want to try my Pumpkin Pecan & Chocolate Granola Bars. Line an 8 x 8 pan with baking parchment. Make sure a little hangs over the sides so you can lift it out easily when ready. Put maple syrup, almond butter, apple sauce and salt into a large bowl and stir together so it's well combined and smooth. Pour in the oats, cherries, almonds, flax and chia. Stir well together. It is a very stiff mixture so is a little difficult to stir. Spoon into the pan and press down really well all over. If you do not wish to bake the granola bars then cover the tin with cling wrap and place in fridge for at least 3 - 4 hours. If you are baking then place in the preheated oven and bake for 20 - 25 minutes. Remove when the edges start to go golden brown. Mine took 22 minutes. Leave to cool for about 20 minutes. Lift out of the tin using the excess paper as handles and place on a chopping board. Cut into 10 even pieces. I find a pizza cutter does a great job of cutting up bars and slices like this. Store wrapped in the fridge for up to 3 weeks. I know in the UK apple sauce is hard to buy. It is however very easy to make yourself. Just cook down a couple of apples with a few tablespoons of water until soft then blend until smooth. Thank you. They will be wonderful with the chocolate! What a great treat! :-) Cherry and almonds are the perfect combo! Thanks Sina. I agree. They are a match made in heaven! Cherry and almond are such a perfect pairing! I think I’d definitely enjoy these raw. Why bother baking when you can have that chewy, creamy almond butter goodness? I love them both ways, in fact I often cook half and leave half raw so I have a selection of both at hand! I love homemade granola bars! These sound great with the cherries and almond mix! Thank you Sophia. Almonds and cherries are such a great combo! I love dried cherries so much, they are so good and I love all the ingredients in these! They look delicious and healthy and a wonderful texture! I love making granola bars at home. Thank you Brandi. 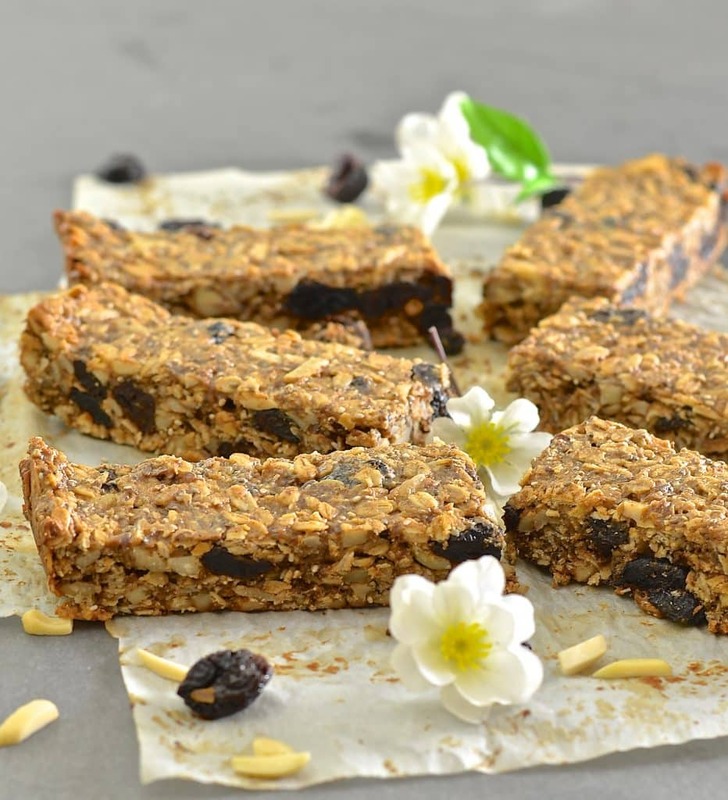 you certainly can’t beat a homemade granola bar! Dried cranberries are awesome! I love adding them in bars and I always have some dried blueberries on hand too. When I’m too lazy to make a bar, I can just grab a handful :). Dried fruit of all kinds is such a fantastic ingredient or snack! Cherries and almond are the perfect combo! Love that these are super easy! Thanks Jenn. I love that they take literally minutes to throw together and if you’re feeling lazy you don’t even have to bake them either! These look like a lovely treat even sans chocolate! The raw or baked option is nice, I think I would go with raw because a non-date based raw granola bar is a rare find and it sounds delicious! Wow, these look fabulous! I’ve never made my own granola bars from scratch, but you have me very tempted. They would be such a great easy breakfast or snack. Plus, I know my husband would love them in his packed lunch! ooo I was just watching a “Good Eats” episode about making your own granola bars.. These look easy! And I think I have all the ingredients. Thanks!! Dried cherries are something I’d never eaten before this recipe. Now I can’t stop! Oh my gosh, these look so good! I love cherries and almonds together! Thanks Becky. They are a great combo!